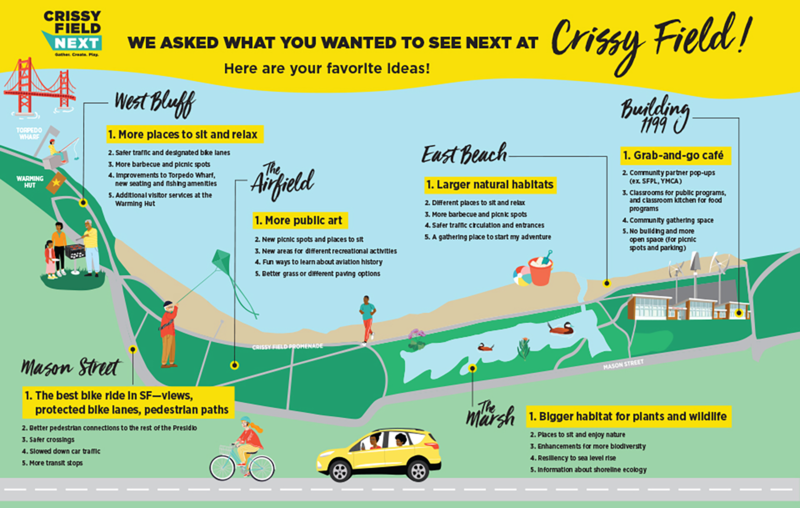 In fall 2018, we received feedback and ideas from hundreds of people excited to contribute to the future of Crissy Field. We kicked off the project in October with Crissy Field Day, an event where over 600 people gathered to celebrate the future of this special place. Throughout the fall, we also held several Roving Ranger Pop-Ups to solicit ideas and feedback from folks actively enjoying Crissy Field. Thank you to everyone who participated! Download the complete Infographic to learn more. Download a screen readable text of the infographic. One thing we learned through this process? While you love Crissy Field, most of you think it has more potential so that all visitors are able to enjoy the park for decades to come. So, what did we do with all of those ideas? Our project team has taken your feedback – along with input from park staff and partners, community stakeholders and experts in the field – and started drawing up design ideas. We’re also taking into consideration other factors, such as the ongoing construction of Presidio Tunnel Tops and the increasing popularity of Crissy Field. We’re excited to share these design ideas with you this summer. On June 1 from 10am – 2pm, we’ll be hosting a Crissy Field Next Open House at the Crissy Field Center. This public event will allow us to share design concepts and options that best reflect the input we’ve gathered. You’ll also have a chance to talk with the project team at the Open House while enjoying family-friendly activities and snacks. Can’t make the Open House? Our Roving Ranger Pop-Ups will continue to welcome walk-up feedback at Crissy Field throughout the summer. We want to make sure we’re getting it right! Dates for the Pop-Ups will be published on this website as we finalize them. Email us anytime with your ideas and feedback. We are logging these as they come in! Sign up for our Newsletter to stay in the loop on project updates, including info on the Open House on June 1.